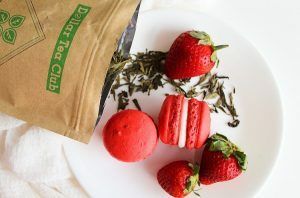 Melissa @Ragsy_Pastries created these tea inspired Macarons using our blends. 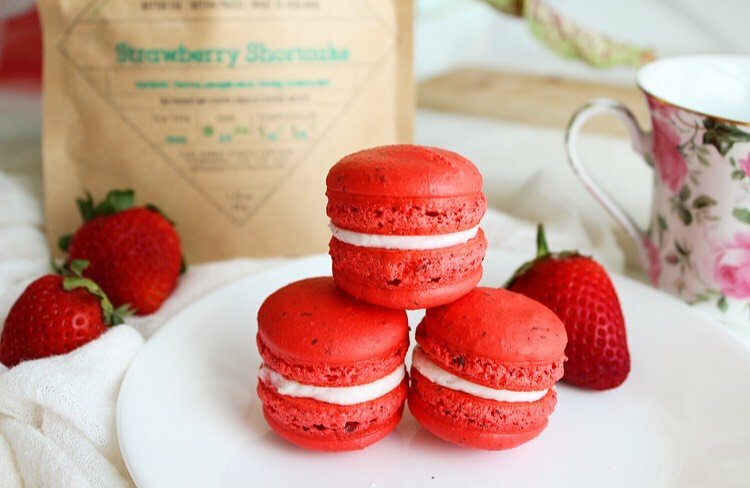 She shared her Strawberry Macaron Recipe so you can make your very own too! 3 Eggs Whites, Room Temp. 1. Prepare your sheet pans with silicone mats or parchment paper. Next, add your tea, almonds, and powdered sugar to a food processor and pulse until very fine. Set aside. 2. Begin whipping your egg whites on medium speed with an electric mixer. Once frothy, add in your granulated sugar and continue whipping until a firm meringue is formed. You can tell it’s ready by pulling away your whisk and seeing stiff peaks; If they fall over keep whisking! 3. Pour 1/2 of your almond meal mixture into your meringue and gently fold together with a rubber spatula. Once combined, gently fold in the other half. You’ll want to fold until it comes together and not much longer. It’s very important you don’t over mix! Once finished, your batter should be lava like in texture and slowly drip off your rubber spatula. 4. Next, use a piping bag with a round tip (I used Wilton’s 1A) and fill with your macaron mixture. 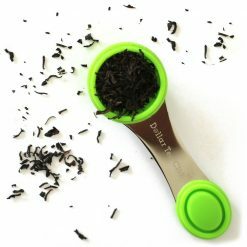 You’ll want to pipe out circles about 1 1/2 Inches wide. After you’ve piped all your batter, slam your sheet pans onto a hard surface to release any bubbles. Use a toothpick to smooth any craters. Set aside and let sit for 20-30 minutes, letting your shells harden before baking. Use this time to start working on your fillings. 5. For your coulis, add your strawberries, tea, sugar, and 1/4 cup water to a saucepan and put on medium heat. While you mixture is simmering, break apart chunks of strawberries with a wooden spoon until no large chunks remain. In a separate small bowl whisk together your remaining TBS. of water and cornstarch. 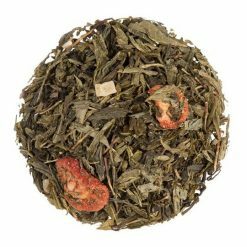 Once combined, add to your saucepan and rapidly mix together until fully incorporated. Continue to simmer until your mixture is thicker and all strawberries are broken down to small pieces. 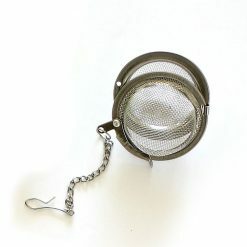 Pour through a strainer to separate out your tea leaves and remaining strawberry chunks. Set aside in a heat proof bowl to thicken and cool down. 7. At this point your macarons are probably ready (test them by touch, they should be firm). Pop them in the oven for 22-26 minutes until they just start to turn golden. Take out and let cool on your sheet pans. 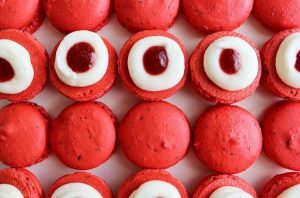 There you have it, delicious Strawberry Shortcake Macarons! 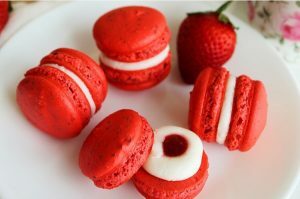 Thank you Melissa @Ragsy_Pastries for creating this awesome Strawberry Macaron recipe! 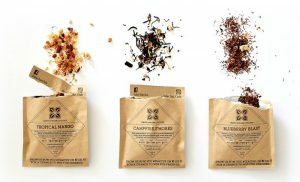 Try 3 New Blends, Every Month… For $1.